A well visit to your pediatrician is important for your child's health at any age. A lot goes on during these visits, especially for new parents, but you can learn to make the most of them by talking about these important topics during the time with your child's doctor. Newborns and Infants: After the first visit to their pediatrician by 3-5 days after they are born, visits to the pediatrician continue at 2 weeks and then 2, 4, 6, and 9 months. Toddlers: Visits to the pediatrician begin to space out a bit at this time, with well appointments at 12, 15, 18, and 24 months. Preschoolers: Before kindergarten, there are visits at 3 and 4 years. Middle Childhood: By age 5, well child visits move to a yearly schedule. 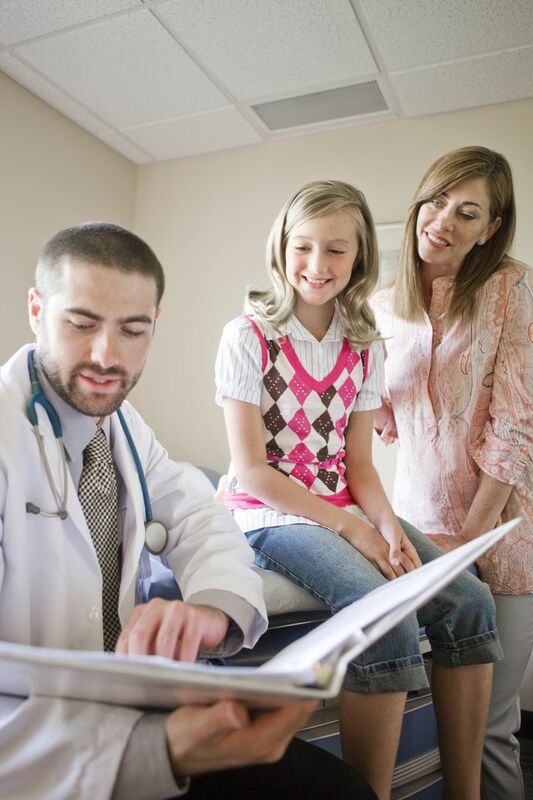 Tweens and Teens: Older kids can continue going to their pediatrician each year until age 21. These are the standard preventative care visits at which kids are measured, have a developmental assessment, physical exam, get vaccines, and are given anticipatory guidance about safety, nutrition, sleep, and behavioral issues. But don't forget to also discuss these important issues. Instead of being surprised with a screening form or quiz at the your child's checkup, consider filling them out before the visit and bringing the form or results with you. Or schedule a separate, specific appointment to talk about a positive screening quiz for teen depression or drug use or if you think your child has autism. Have there been any changes at home recently? Be sure to tell your pediatrician about any changes, as these could affect the way your child thinks and feels. A separation, divorce, or even new marriage are all things that your pediatrician should know about. Your pediatrician will likely know if you have had a new baby, but may not automatically know if you have remarried and your child has three new step-siblings at home. Let your pediatrician know about these types of changes, including any deaths in the family, especially if you think that your child might be having trouble adjusting and needs some extra help. How well does your child make friends? Do they have a best friend? Do they get bullied? What do they do for fun? Are they involved in any after school activities? Do they ever bully anyone else? Not every kid needs to be a social butterfly and be friends with everyone at school, but not having any friends is a red flag that they are having problems. Talk to your kids about their friends (or lack of friends) and tell your pediatrician if you are concerned. Has your child had any big medical problems since the last checkup? Have you had to go to an urgent care center at night or on the weekend? Did a sports injury at school send your child to the ER with a concussion? Is your child undergoing any treatments for chronic or sudden problems by a specialist? Although your pediatrician's office should be your medical home, which would mean that your pediatrician is aware of all of your child's medical issues as they happen, it doesn't always happen that way. Be sure to update your pediatrician about these any incidents and new treatments, including any medications your child has been prescribed. And just as you would at a sick visit, be sure to tell your pediatrician about any over-the-counter medications that your child is taking. You should also tell your pediatrician about any alternative treatments that you have been trying or are thinking about trying. Do you take your child to a chiropractor or for acupuncture? Do you give them vitamins or use essential oils? Are they interested in protein shakes because they think it will give them bigger muscles? While knowing about a recent trip is more important if your child is sick, be sure to tell your pediatrician about any upcoming travel plans you may have. Are you going to be traveling out of the country soon, which may mean that your child needs some special travel vaccines? Some trips may also mean that you need a prescription for malaria prevention pills. Some doctors tell older kids they can continue to see them as a pediatrician as long as they are in school, figuring they will move on once they graduate from college. Then there are younger teenagers who sometimes think that they are too old to continue going to a pediatrician. Talk with your doctor about a transitional plan that works best for you and your child. Checkups aren't just so your kids can go in and get shots. Make the most of them to make sure your child is growing and developing well, both physically and mentally. When Should You Call Your Pediatrician? Which Combination Vaccines Can Help Your Kids Get Fewer Shots?